Your cuticles are an important part of your overall nail health. These small folds of skin help keep your nails healthy and strong. When cut or damaged, they can become painful and lead to infection. However, there are easy ways to care for a damaged nail cuticle. The cuticle’s main purpose is to shield your nails from fungus, bacteria and yeast. Its overall function is to keep you healthy and prevent infection. Also known as the eponychium, a cuticle is essentially a waterproof, protective seal that serves as part of your body’s natural defense system. It’s comprised of dead skin cells and is between the nail and the edge of your skin on each finger and toe. The most common way to damage your cuticles is to cut them too closely with nail scissors or clippers. This condition can become serious if you don't sterilize the cutting instrument properly. Cuticles also can split and crack if your skin gets too dehydrated. Dry skin also can lead to hangnails, which tear the cuticle, creating ragged edges and open wounds. A damaged cuticle usually appears red and irritated, but it might bleed if the injury is more significant. Treatment for a damaged cuticle depends on the severity of the injury. You can heal peeling or cracked cuticles by moisturizing them several times a day until the condition improves. Jojoba and vitamin E oils also aid in your recovery. If the cuticle becomes infected, you might need to apply an antibacterial or antifungal cream for five to seven days. However, if you have pain or the condition worsens, consult your doctor. If your nail injury seems more serious, you might have damaged the nail bed or matrix. 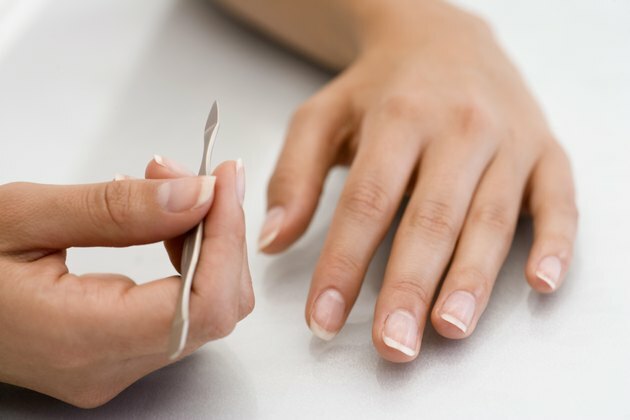 Your nail bed is a hard plate just below your cuticle that supplies your nail with blood and vital nutrients, which give them their pink color. Your nail matrix is the most important part of your nail. Located below your cuticle at the bottom of each nail, the matrix is where the cells that make up you nail are produced, so damage to the nail matrix could distort your nail or impede its growth completely. Mike Roizen, M.D., chief medical consultant on “The Dr. Oz Show,” advises against pulling hangnails. “Doing so almost always results in ripping off living tissue, which is painful at best, and possibly a cause of severe infections,” Roizen explains. He also recommends protecting your hands with cotton-lined rubber gloves when using soap and water for extended periods. Would a Vitamin Deficiency Cause Split Toenails?